The design of a system for any house of worship or live venue is as much of an art as an engineering function. In these facilities, more than any other, the feeling created by the lighting, sound and visual displays must be done in a subtler way, and at the same time be as effective as any meeting room or auditorium. Sound Stage began its business meeting the audio visual needs of local churches. 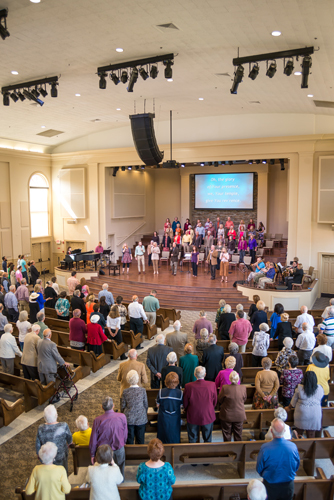 We began in 1982 with the design of our first church. Since that time our expertise has increased and so has our client list. Our designers are experts at this fine line of planning. While taking into consideration the experience you want for your day to day engineers, we also will take into consideration all the engineering details to make your presentation seamless and your equipment easy to use. Acoustics in modern ministries today are a far cry from traditional churches. Sound Stage designers will work closely with your clergy, music directors and building committees to be certain that your unique needs are fulfilled. We use the Bose® Modeler acoustical analysis system to predict reverberation, reflection, dead spots or hollow spaces. We will provide comprehensive designs showing equipment placement and necessary acoustical treatments required to provide the best sound. Your completed design will give you a fully integrated system that is flexible, versatile, easy to use and offers the clarity of speech and musical performance you desire. Although sound is important, your system is more than sound; our certified lighting designers will create an ambiance that will provide a peaceful environment while keeping the focus on the presenters. The addition of video is becoming more and more popular; we can craft you a custom state-of-the-art system to meet your needs. Whatever your needs Sound Stage is dedicated to helping you to enhance the experience for your audience.